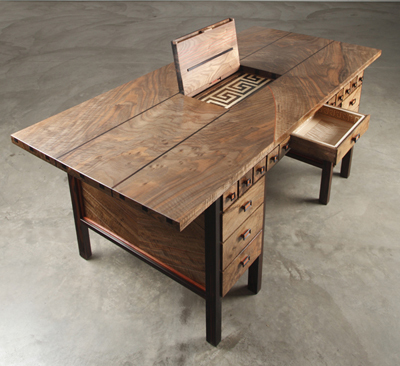 It is quite likely this is the coolest desk in the world! 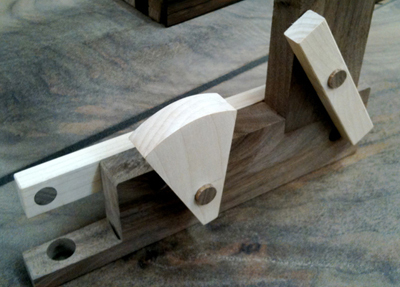 It is entirely made from solid wood down to the last screw. 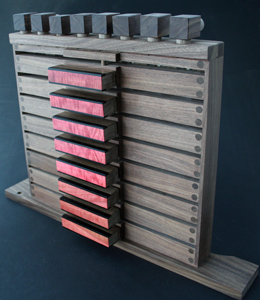 It features an octave of functional wooden organ pipes. 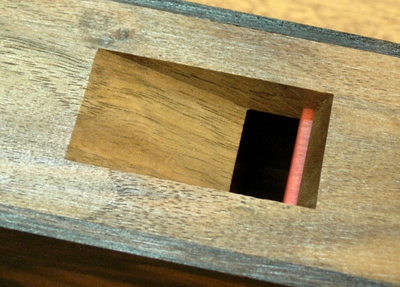 Should you play the correct sequence of notes or tune, a secret compartment opens up. 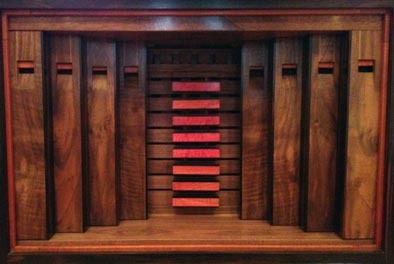 When you push in a drawer, air is directed to one of the organ pipes at the front of the desk, sounding a note. Some of the air is also directed into a pneumatic memory board. The memory board within the desk actually keeps track of the notes played and work on the same pricipal that computers store memory. In this case it remembers the notes played. When it picks up the correct tune it triggers a pendulum which opens a secret compartment. The memory board, can be reprogrammed to read a different song. 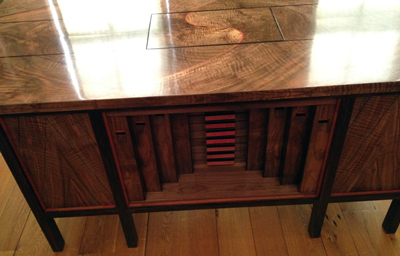 It is powered entirely by air flow from the drawers, and it is made entirely from solid wood. This took countless hours of prototyping and five different versions were constructed before I settled on the version here. Hidden in the desk are over 20 other puzzles and secret compartments storing clues and scraps of information for anyone on a quest to play the correct song. 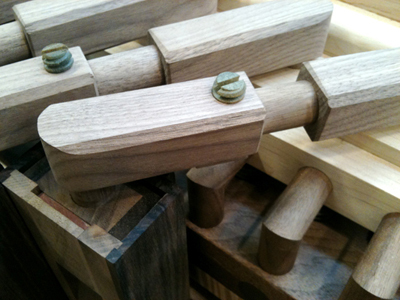 A wooden inlayed score of music must be assembled if you are to know the song! This project has been an odyssey for me. I am refreshed to be nearing the end a long journey, having learned a lifetime of skills along the way. 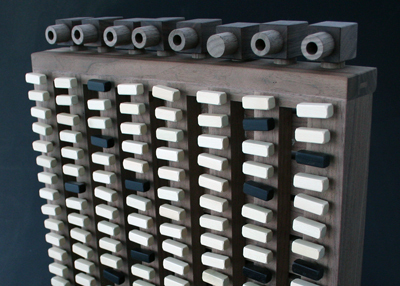 The pneumatic memory board and organ pipe octave. 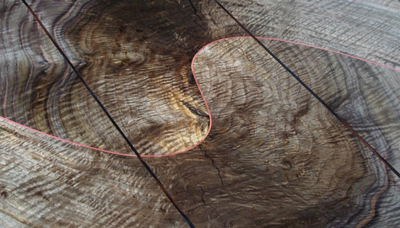 The wood grain on the desk top. 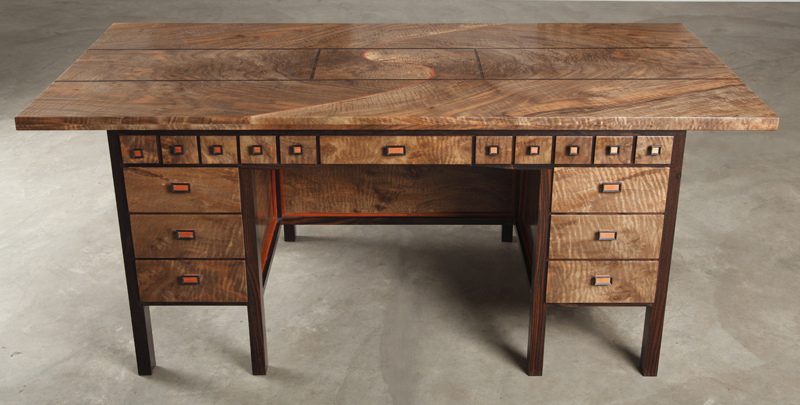 Wooden air connectors inside the desk. The final version of the pneumatic memory board. Adjusting these pegs on the back of the memory board changes the tune it reads. The dark pegs represent the notes of the song. Part of the pendulum lock. The mouth of an organ pipe. This can be adjusted to play any note within an octave. All organ pipes can be tuned to perfect pitch. An individual logic switch from the memory board. In the background are extra switches showing the nodes where air enters the switch. When air enters one side it either closes or opens the path for a second source of air to flow in and out through the central holes. 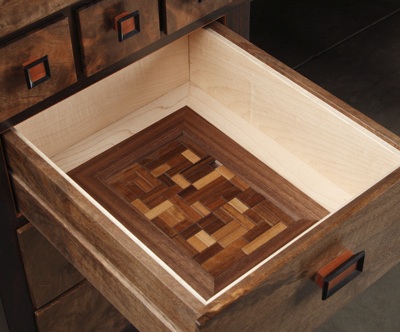 All large drawers have puzzles inside. 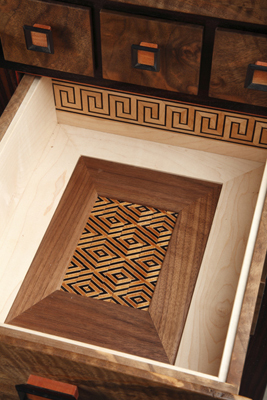 You will need to solve these puzzles to open other drawers or find secret compartments. A very challenging drawer puzzle. 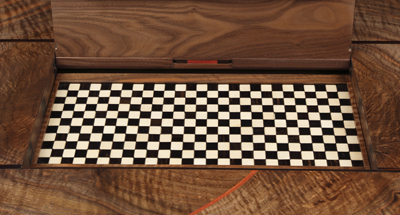 A secret button opens the center of the desk revealing a checker pattern. 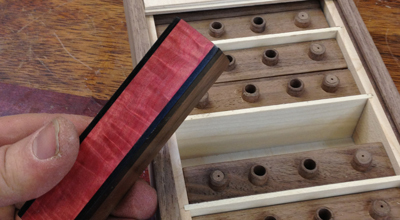 If you find a way to rearrange it into a key pattern the center drawers unlocks.